Light of Darkness was created by West Bengali artist Sanchayan Ghosh, with support from UK based artist Graham Robinson, and commissioned for 'Enlightenment', Durham City's festival of light in November 2008. Light of Darkness evolved out of research into the local history and folklore of Durham. The light installation was inspired from folklore about Saint Bede after he became blind: it also referred to the history of coal mining in Durham. 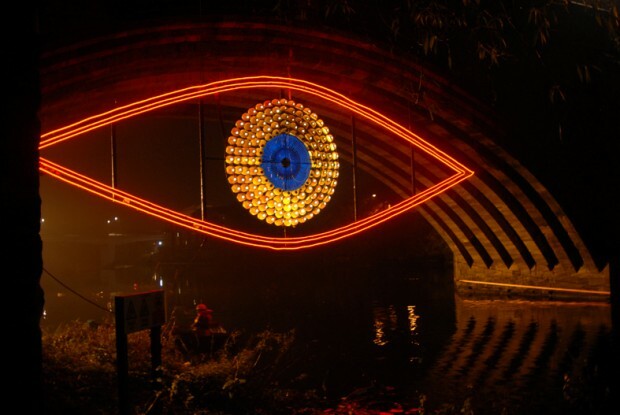 The two eyes installed between each of the two arches of Framwellgate Bridge in Durham were made of miner’s helmets with lamps that formed the eyeball and the iris was made of a tapestry of El cold light. The installation was a memoir to the life and work of Saint Bede and the coal miners of Durham. "I am inspired by the folklore where even after Saint Bede became blind at the later part of his life he could inspire a group of rocks and broken trees in a jungle with his sermon. So this installation is a memoir to the life and work of Saint Bede who can be looked upon as a bridge between faith and rationality, science and realization. Just as the soul of city of Durham dwells on the cathedral and the castle, the coal mines that used to lie across the river Weir helped to the sustenance of project of Enlightenment in 18th century England. The great act of cutting coals in the darkness from the core of earth is like bringing light from darkness. So this installation is also a memoir to the miners of Durham. Tradition of knitting and patchworks developed in England in the age of Enlightenment and can be looked upon as a parallel system of knowledge that grew in the core of the domestic life of working community. There were numerous knitting clubs in miners' colonies. As far as the shape of the eye is concerned I am inspired by the traditional wooden mask from Bengal which formed a bridge between real and the iconic. Moreover the reflection of the full eye on the river water will create a double eye situation and will help to create an experience that is equally real and metaphysical." Although I am trained as a painter in Kala Bhavana, Santiniketan (Institute founded by Nobel Laureate Rabindranath Tagore) my days as student of Santiniketan introduced me to the numerous annual community based interactive events that are performed in Santiniketan for the last 80 years. Moreover my training under famous third theatre explorer Badal Sarkar (who lives in Kolkata) also introduced me into the periphery of interactive space and public communication. Presently my work focuses on exploring methods of participation in multiple public sites and evolving sites specific process of community based art activities. In this respect I have had the opportunity of working in different public sites starting from general public spaces like outside of theatre auditoriums, in reference to public monuments, school and college campuses, historical buildings to more private community spaces like private housing complex and community halls.I have had the opportunity to work with three generation of Asian communities in Bristol as a Charles Wallace scholar. I have also worked with the weavers of Bodo communities of Assam in eastern India and other migrating communities in Kolkata and India. So most of my works are research based activity that evolves into site specific installation, installation performance or interactive community events. My present area of concern revolves around transformation of land, history, memories, people and home. In this respect I am interested about the context of identity, shift and the emergence of new spaces of relationship. Most of my installations are multi sensory and interdisciplinary that involves both the aspect of new media and dialogical, interactive situations.